Man-purse toters have a slight advantage here: they can use a heavy-duty case to store their resting earbuds — such as the SendStation earBuddy (shown here) — and not feel like they’ve solved one problem only by introducing another strange pocket bulge. Yes, the earBuddy seems the perfect solution for the thousands among you who are quite happy to wind fully the cords on their earbuds and place them neatly in a ballistic-nylon case every time you use them. It costs $14.95 and yes, it doubles as a keychain. For those of us slightly less . . . er, particular with our cords, the Audio Outfitters earPod provides protection for the earbuds’ foam covers and a reel to wind the cord around, for just under $10. 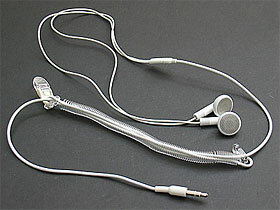 The earPod can also be used to shorten the headphone cable if it’s dangling, but it looks a little awkward doing it. Available at the same price, the Tuneclip from Tunewear is a dedicated dangle remover only. A spool on a clip, it can attach to your clothes or man-purse and take up your cord slack with a simple spin. Part Slinky, part telephone cord, and part python, the Cord Gatherer from Power Support is a flexible sheath that swallows errant headphone cables and smothers them into submission. You can cut yourself more or less slack merely by unhooking plastic tabs at the ends of the Cord Gatherer and pulling in the right direction. It’s an even $10. But the general favorite of informed iPod users concerned about excessive cord drape appears to be the simplest and (at $5) the cheapest of all: the Sumajin Smartwrap. It may look like a cross between a floss threader and a miniature doggy biscuit, but it gets the job done: It’s easy to wind, easy to adjust (for those moments your head needs to bob to the beat just a little more freely), and it stays attached to the cord. Plus it comes in a wide variety of unmanly colors. This entry was posted on Monday, March 6th, 2006 at 11:12 pm	and is filed under Accessories, Manufacturers. You can follow any responses to this entry through the RSS 2.0 feed. You can leave a response, or trackback from your own site.